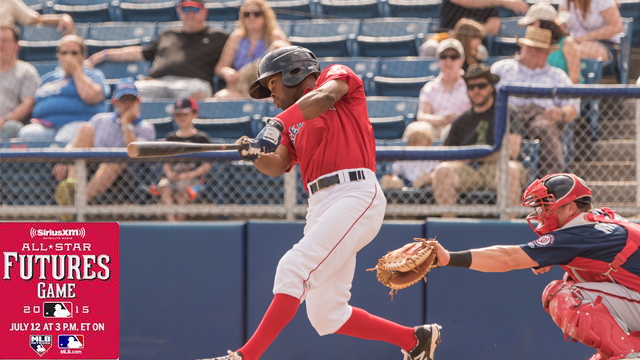 Portland, Maine - Portland Sea Dogs' outfielder Manuel Margot has been selected to the World Team for the 2015 SiriusXM All-Star Futures Game. The 17th-annual game takes place at Great American Ballpark in Cincinnati on July 12th at 3:00 PM ET and can be watched live on MLB.com and MLB Network. Margot, 20, will be making his first ever all-star appearance in professional baseball. He was named a MiLB.com Organizational All-Star for Boston in 2014. Margot was promoted from High-A Salem to Portland on June 22nd and is hitting .154 (2-for-13) in three games with the Sea Dogs. In 46 games with Salem, Margot hit .282/.321/.420 with 3 home runs and 17 runs batted in. His five triples were tied for third-most in the Carolina League, and his 20 stolen bases were the fourth-highest in the league. He was also the most difficult player to strike out, averaging 13.2 plate appearances per strikeout. Margot entered the 2015 season as the No. 7 prospect in the Red Sox system according to Baseball America and the No. 72 prospect overall. The San Cristobal, Dominican Republic native was signed by the Red Sox as an international free agent on July 2nd, 2011. Margot joins Low-A Greenville third baseman Rafael Devers as the two representatives of the Red Sox organization to be selected to the game. The 25-man rosters for the USA and World teams are selected by Major League Baseball in conjunction with the Major League Baseball Scouting Bureau, MLB.com, Baseball America, and all 30 Major League clubs. Each organization is represented and players from all full-season Minor Leagues are eligible to participate. Sea Dogs that have participated in the Futures Game in the past include Henry Owens (2014), Sean Coyle (2014), Garin Cecchini (2013), Anthony Ranaudo (2013), Chih-Hsien Chiang (2011), Will Middlebrooks (2011), Junichi Tazawa (2009), Clay Buchholz (2007), Edgar Martinez (2006), Todd Claus (2005 & 2006), Hanley Ramirez (2005), Juan Perez (2004), Jorge De La Rosa (2003), Ron Johnson (2003), Kevin Youkilis (2003), A.J. Burnett (1999), and Pablo Ozuna (1999). Tickets for all remaining Sea Dogs home games and the Sullivan Tire All-Star Classic are still available and can be purchased by phone at (207) 879-9500 or online at seadogs.com.